Bushnell, IL Post Office, WPA mural entitled "Pioneer Home in Bushnell" painted by Reva Jackman in 1939. No one knows for sure when the first native Americans came to the area later called McDonough County, thousands of years ago, but a seasonal hunting camp located at “Wigwam Hollow” was evident through the 1820s. 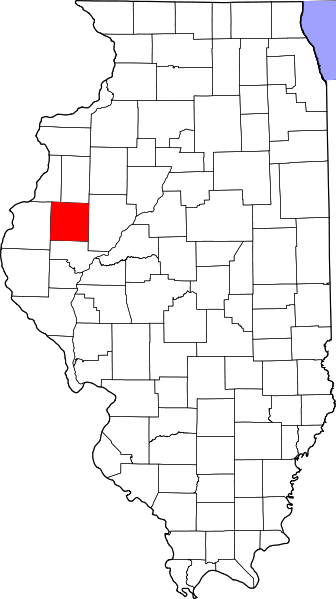 The first white settlers, William Carter and Riggs Pennington, came in 1826, the year when McDonough County was established. The county seat, Macomb, was laid out in 1831, and a log courthouse was constructed. In the following year a jail was built, as wooden shops went up around the square. In 1855 the first railroad, the Northern Cross, came through Macomb, and nearby towns like Bushnell and Colchester were started as the frontier passed away. A modest brick courthouse, where Lincoln spoke in 1858, was replaced by a large and lovely one completed in 1872. Still being used, that courthouse is now on the National Register. Around it is a lovely town square that still reflects the later 19th century and is now being preserved as an historic district. North of the square is 130-year-old Chandler Park, which has several monuments and a traditional small-town gazebo. The Al Sears Jazz Festival and Gazebo Arts Festival are held there every September. Just north of the park is an historic railroad depot, constructed in 1913. A college town since 1837, Macomb became the site of Western Illinois State Normal School, established in 1899. The stately main building, now known as Sherman Hall, was partially completed by 1902, when classes began. It is also on the National Register. A university since 1957, Western has an historic Art Gallery, a Geologic Museum, and huge collections of historical records, regional photographs, and books at Malpass Library. The Western Illinois Museum is located south of the Macomb square, and even the town’s City Hall is an historic building and tourist site, decorated with vintage photographs. An annual festival, known as Heritage Days, celebrates the history of Macomb and McDonough County in late June. The McDonough County Historical Society is the well-informed, energetic voice of historical awareness for this remarkable, heritage-oriented community and county. The History of McDonough County by S. J. Clarke. Google has digitized this book, and it is fully "searchable".